Performers from the West End casts of Les Miserables and The Phantom of the Opera have raised around £12,000 in a charity football match between the two shows. 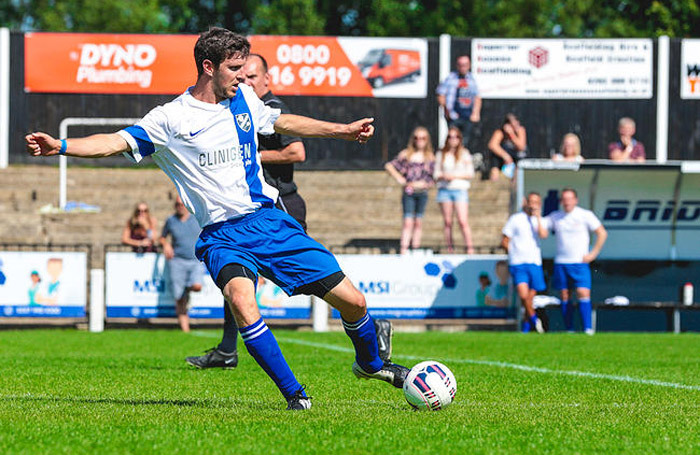 The fourth annual Les Mis versus Phantom game took place at Bromley Football Club on Sunday (August 2), opening with performances by West End stars including Kerry Ellis, Killian Donnelly and Rachelle Ann Go. Money was raised through ticket sales to the match, as well as collections that were taken at Her Majesty’s Theatre and the Queen’s Theatre on Saturday evening (August 1). He explained that the fundraising total had not yet been finalised, but is expected to be around £12,000. The match was held in memory of Melanie Oakley-Dow, Les Miserables’ head of wigs, who died in 2013 . All money raised will be split between MAD Trust and Macmillan Cancer Support – the latter in memory of Oakley-Dow. Last year’s match raised £20,513 for Cardiac Risk in the Young and Macmillan Cancer Support.